Walter Paget (1865–1935) was primarily an illustrator of Victorian novels such as Treasure Island, King Solomon’s Mines, The Arabian Nights, and an edition of the Lambs’ Tales From Shakespeare. He was chosen to be the illustrator for Arthur Conan Doyle’s Sherlock Holmes novels, but due to a mix-up in addresses, the commission instead went to his brother Sidney. Walter’s face, however, was used as a model for Sidney’s portraits of Holmes (Victorian Web). 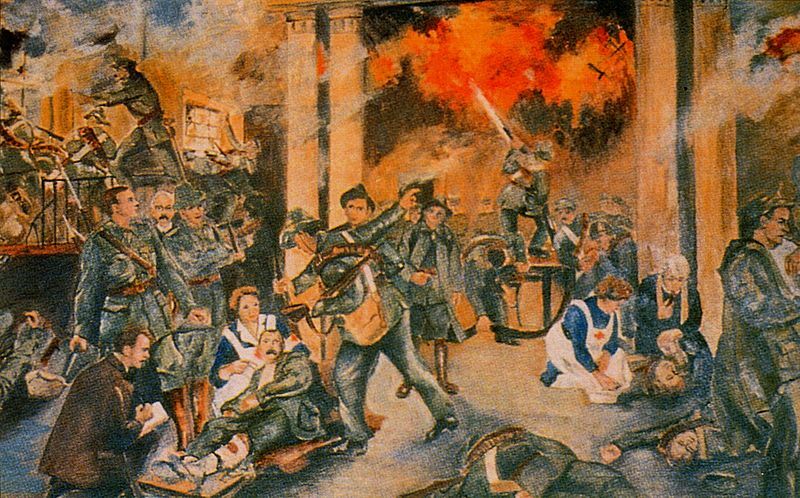 Paget’s painting The Birth Of The Irish Republic shows the scene inside the GPO during the Easter Rising, focusing entirely on the rebel forces. James Connolly lies injured on a stretcher (being tended to by a nurse, possibly Elizabeth O’Farrell – WP), while Pearse, Clarke, and Plunkett stand by. It is not known why Paget chose to depict the scene; Robert Ballagh speculates (History Ireland) that it was painted for a Dublin printer as part of a commemorative series. The first mural to reproduce the painting was in 2002 on Berwick Road/Paráid An Ardghleanna in Ard Eoin/Ardoyne. 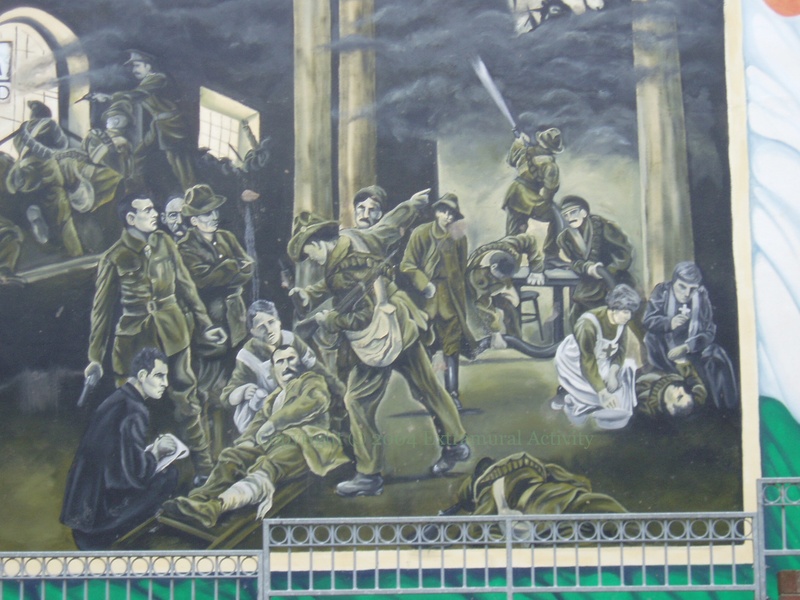 Second, a version on the side of the Felons’ Club in Andersonstown, painted by Marty Lyons. This mural was updated in 2016, with the smoke at the top turned into a giant phoenix. 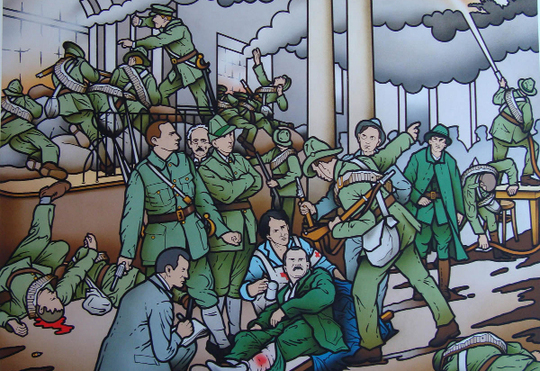 This next version is not a mural but Robert Ballagh’s 2012-09 limited-edition print which was produced as a fundraiser to repair the memorial to the Easter Week Volunteers in Glasnevin Cemetery, Dublin (History Ireland). 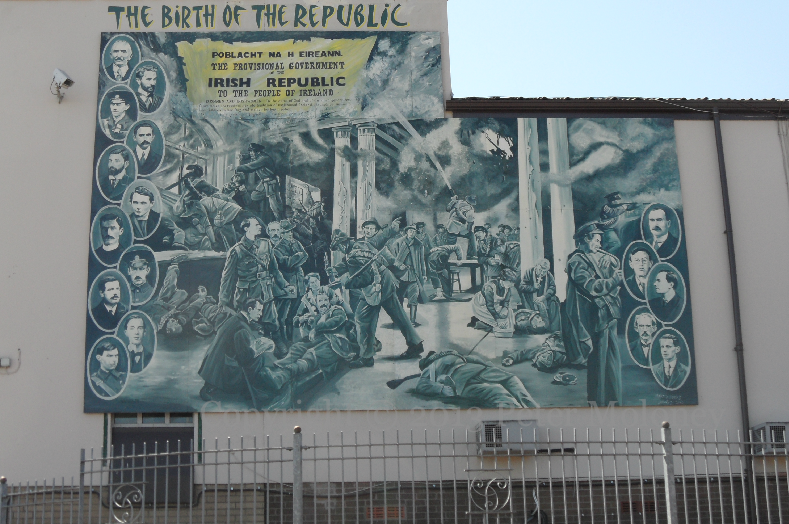 The final version – which uses the proclamation and Tricolour as a background – was painted for the travelling exhibition of Easter Rising memorabilia that included a stop at the PD club in Andersonstown.